Hand Finished Custom Body Jewellery with a stunning Tie Dye effect. At JoBananas we are always striving to come up with different and unusual body jewellery. We want you to stand out from the crowd and have some unique jewelry for your piercings that make people go "Wow!!!" We think with this effect we have certainly met that brief! The segment ring pictured above is top quality implant grade 6AL4V-ELi Titanium (grade 23) it is heavy gauge 6mm (2g) x 16mm (5/8") and suitable for large gauge piercings such as stretched ear lobes or male piercings. 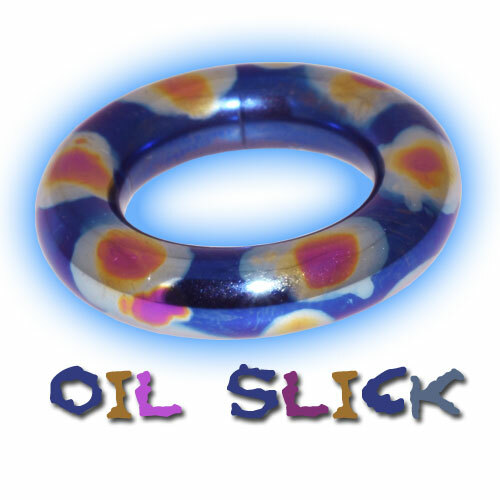 We have hand finished it using an oil slick method to give it a really unusual look that is reminiscent of 70s tie dye. The main colour is blue, but there are splodges of silver with yellow and pink centres. It looks even better in real life than the photograph and it is the only one in existence! Because it is quite a labour intensive process, this piece would retail at £29.99 but it is customised hand finished body jewellery - where else would you find that in the UK? This finish can be applied to most large gauge Titanium items so we could create you your very own large gauge bcr (ball closure ring), PA bar, segment ring or circular barbell. It would be fantastic to get some feedback and to know what you think. Please email us and let us know, and if you would like a hand finished piece just like this one let us know and we can work out a price for you. Just an update to say thank you to the people that have commented so far and shared their thoughts on our new customised Tie Dye range. We have already had a request for a Titanium Belly Bar in the Oil Slick finish, so here it is - we think this looks truly stunning and don't forget each one will be hand finished so they will all look totally unique. The belly bars are now available to buy (click the photograph above) in 6mm, 8mm, 10mm, 12mm, 14mm, 16mm or 18mm with a 5mm top ball and an 8mm bottom ball.